I'll have to dig out side B.
Ive heard this on many CD's Lp's over the years but none have the crisp clean sound of the guitar on this one!! Which is why I endeavor to do these from "not very clean/mint" 78's, I Hate it when some "engineer" thinks he will remove all the noise "dulling" the instrument's in the process. 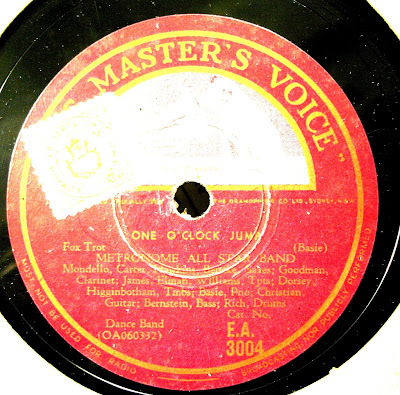 ''Metronome All-Stars 1941: "One O'Clock Jump"/"Bugle Call Rag", recorded by Harry James, Ziggy Elman, Cootie Williams, Tommy Dorsey, J. C. Higginbotham, Benny Goodman, Benny Carter, Toots Mondello, Coleman Hawkins, Tex Beneke, Count Basie, Charlie Christian, Artie Bernstein, Buddy Rich. Metronome All Stars - One O'clock Jump MP3 "Good"
Metronome All Stars - One O'clock Jump MP3 "Too Much Noise Reduction"
Metronome All Stars - One O'clock Jump MP3 "Fake Stereo"